PFLITSCH extends its range of splittable cable entries with the fully splittable UNI Split Gland plastic cable gland. The cable gland body and the pressure screw consist of two halves, the sealing inserts are slit at the side and thus allow preassembled cables to be placed in them. The special point about the UNI Split Gland: the splittability of the cable gland body allows the whole of the hole diameter (M25) to be used for feeding through prefitted plugs. The UNI Split Gland is based on the UNI Dicht principle and therefore ensures the cable is dependably sealed without being irreparably cut into or severely indented. All TPE-V sealing inserts size E 154 from the UNI Dicht range - from the solid to the multiple-cable sealing insert - can be used with the split cable gland. This product reliably seals cables with diameters from 2.0 mm up to 20.5 mm. The soft-squashing action exerted by the sealing insert over a large area of the cable sheath, the seal in the plane of the split and a further seal at the connection thread ensure that the gland achieves IP 67 protection in accordance with EN 60529. 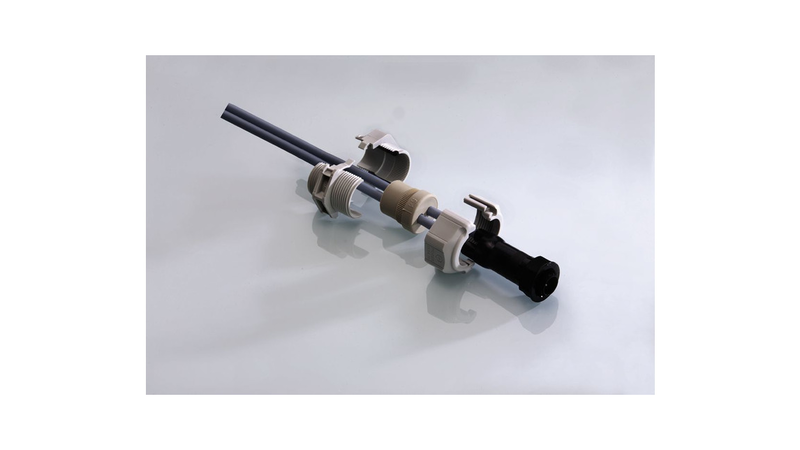 The UNI Split Gland made from polycarbonate also excels with strain relief in accordance with EN 50262 and an operating temperature range of -20 °C to +80 °C. The splittability of the cable gland allows not only preassembled cables to be installed, through its simple construction and low number of components it also offers the advantage of quick and safe installation - without needing to remove already installed cables or interrupt on-going production. The UNI Split Gland can be opened again at any time without great effort to allow cables to be installed or reinstalled later.